Expanding a modern showpiece in Weston adds family-friendly space. 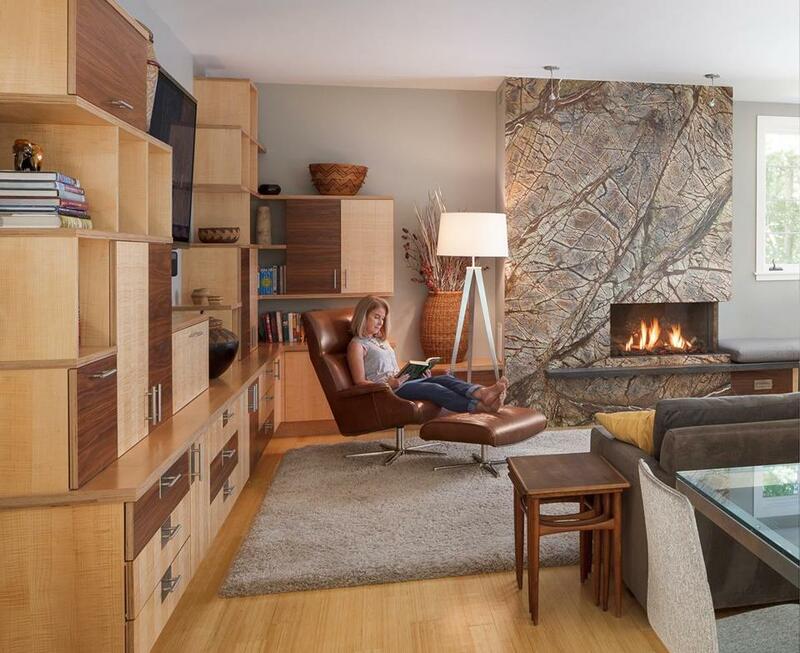 In the family room, homeowner Catherine Riedel relaxes in a leather Beau chair from Room & Board. Architect Gary Wolf designed the custom cabinetry; the exposed edges contribute to the modern feel. Each child has a cabinet to store schoolbooks; a charging drawer corrals electronic devices. In 2007, the couple purchased a 3,500-square-foot International Style house in Weston, designed in 1939 by MIT-trained architect Edwin B. Goodell Jr. for a doctor who had been captivated by the Bauhaus movement on a trip to Germany. Several years earlier, Goodell had designed a similar house next door; both are listed by the Massachusetts Historical Commission and the Weston Historical Commission. Four years later, Riedel, a program coordinator at the child welfare agency Wide Horizons for Children, and Myers, a consultant who works from home, adopted Flora, now 7. Like her brothers, Sergei, 14, and Alexei, 12, she came from an orphanage in Russia. Two years after that, in 2013, Riedel and Myers hired architect Gary Wolf to design an addition. Sited on a hillside with rock outcroppings, the three-story tiered structure was spacious, sunny, and beautifully landscaped, but it lacked current-day amenities, including a mudroom, pantry, and laundry upstairs. Riedel and Myers also wanted another kid’s bedroom, a playroom, and a family room, since the current setup had both adults and all three children watching TV crammed into Myers’s home office, which was originally the maid’s room. In Charlestown, vibrant color helps ease the transition from spacious Colonial to contemporary town house. The L-shaped house consists of rectilinear tiers that Riedel likens to a wedding cake. Wolf fashioned a 1,200-square-foot, three-story addition on the same scale and with the same clean lines as the original. While the overall silhouette is seamless, Wolf differentiated the new portion by cladding it in varying widths of reclaimed sinker cypress and pickle-tank fir boards. The dramatic contrast with the white painted wood exterior of the original structure clearly communicates the difference in eras. “We didn’t want to misrepresent the house by presenting it as a mansion built in 1939,” Wolf says. “We wanted to be true to what it really is — a historic house with an addition.” The new space holds a mudroom and playroom on the ground floor, the family room on the main floor, and a bedroom and laundry room on the third level. 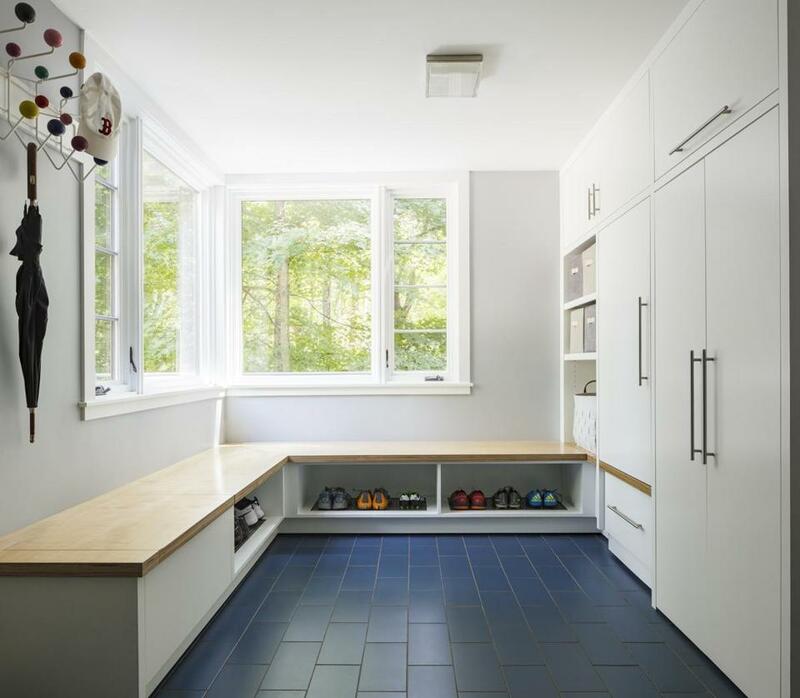 The garage opens to the ground floor of the addition, where the mudroom has a cobalt-blue tile floor, a towel warmer for wet winter clothing, and two walls of cabinetry to hold the children’s backpacks and athletic gear. 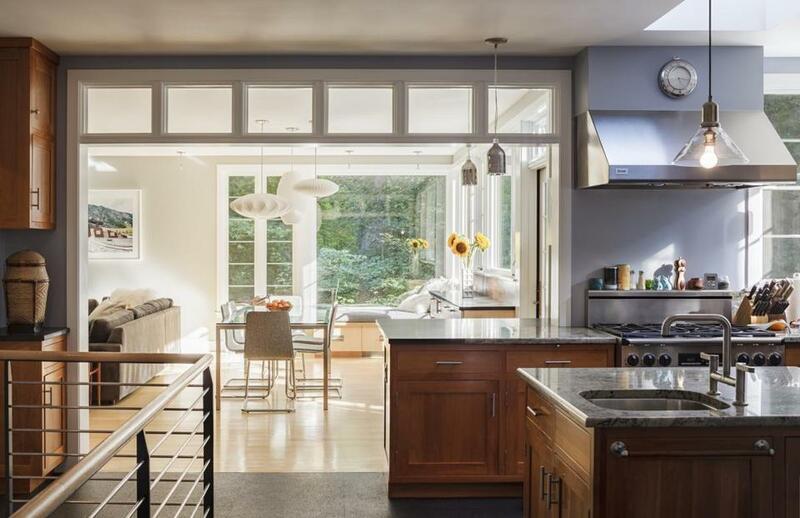 Through a sliding glass door is a once bleak, now modern and airy stairway that leads up to the kitchen, connecting the new part of the house with the old (and the kids to the grown-ups). Wolf reworked a portion of the kitchen and borrowed space from the home office to create a walk-in pantry. The family room, as Riedel had hoped, is the heart of the home. The focal point is the fireplace, with a dramatic floor-to-ceiling surround made from a single slab of Rain Forest marble from GerrityStone in Woburn. The mix of colors and patterns echoes the bare tree branches seen through the windows in wintertime. 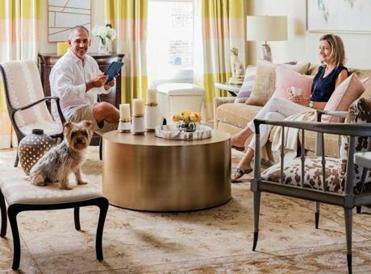 Family-minded furnishings, including a sectional from Room & Board and a cozy corner window seat, create a stylish, no-worry place for lounging. Wolf designed the expanse of cabinetry that anchors the other side of the room in response to Riedel’s request for a storage piece that could function as part homework center, part curio cabinet. It also houses a 60-inch flat-screen television, which displays a video installation of an urban landscape by David Webber, introduced to avoid the soulless-black-box-on-the-wall aesthetic. Riedel and Myers bought it at the School of the Museum of Fine Arts sale in Boston. The asymmetric wall unit is made up of cubbies, cabinets, and drawers constructed from a mix of fiddleback maple and walnut, since Riedel couldn’t decide between light and dark. She loves its playful, haphazard nature and its utility: In addition to holding the video art piece and corralling homework, it accommodates books, photos, and a Chumash basket acquired at the Skinner auction house. She’s particularly pleased with Wolf’s success in containing the stream of papers that return home with the children from school each day. 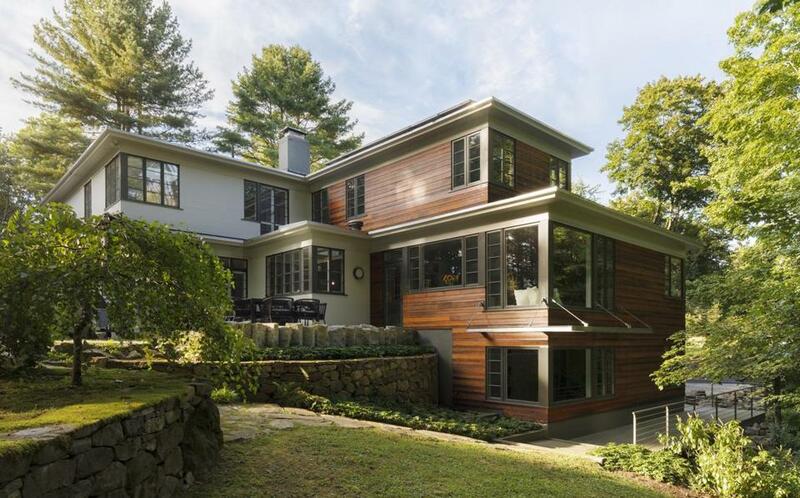 Wolf’s wood-clad addition stands in pleasing contrast to the white painted exterior of the original house. Lincoln-based landscape architect Jonathan Keep redesigned and enlarged the patio outside the dining room. In the kitchen, cabinetry came down to expose the stairs to the playroom. The rail echoes the design of the outdoor deck rails; the floor tiles are made from recycled rubber tires. 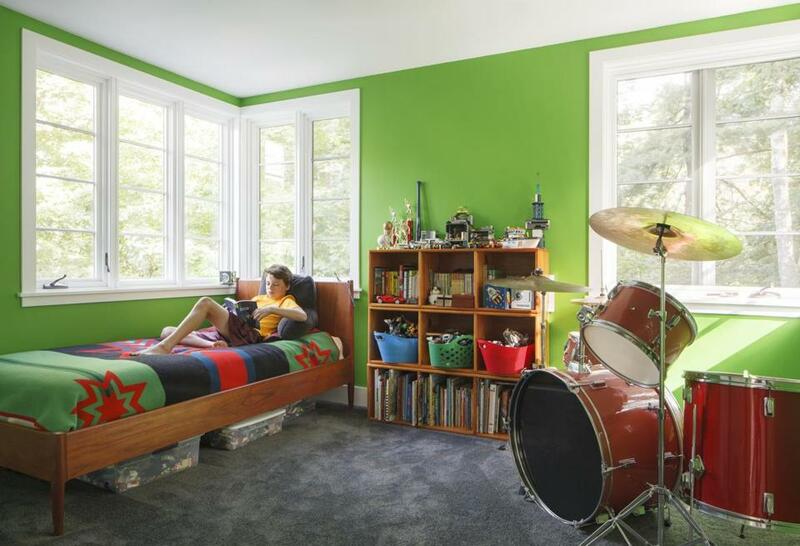 Twelve-year-old Alexei reads in his new bedroom, which is painted Benjamin Moore Tropical Seaweed. The cabinets in the mudroom are paint-grade birch topped with ApplePly, a high-quality plywood that doesn’t need trim. Marni Elyse Katz is a frequent contributor to Boston Globe Magazine. Send comments to magazine@globe.com. Follow us on Twitter @BostonGlobeMag.